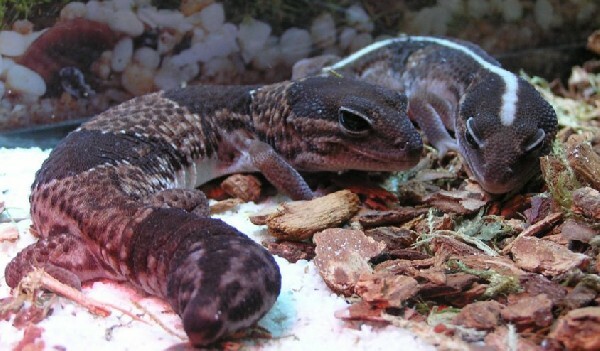 Although not as common in herpetoculture as its close relative, the ubiquitous leopard gecko (Eublepharis macularius), the fat-tailed gecko is popular with both hobbyists and commercial breeders. This species is ideally suited for captivity, being small, docile, hardy, and beautiful. Fat-tails have been heavily imported for years, but the survival rate of these animals has been dismally low, primarily due to heavy parasitization. Wild-caught fat-tailed geckos should be deparasitized, without treatment many specimens will fail to thrive and reproduce. Increasing numbers of commercial breeders are propagating fat-tails in large numbers, so captive born offspring are generally not too difficult to find. Hopefully, enough captive born animals will be produced in the future to fulfill the demand for this species, causing importation to decline. Fat-tailed geckos can be maintained in a variety of ways, but a commercial breeding set-up is the easiest and most practical to maintain. Breeding groups of one male to four females are quite readily housed in sweater box sized (6 x 16 x 23 in or 15 x 40 x 57.5 cm ) (h x w x l) rack systems. The temperature range should be 75-80 degrees F on the cool end and 88-90 degrees F on the warm end. Heating is usually provided by heat tape, controlled with a high quality thermostat. Suitable substrates for commercial breeding set-ups include playground sand, newspaper, and paper towels. Fat-tailed geckos must have access to an area with high humidity to shed their skin properly. The best way to provide for this is to offer a plastic shoe box, half filled with moist peat or sphagnum moss. This humidity site may also serve a double function as an egg-laying chamber. As fat-tailed geckos are nocturnal, they do not require full-spectrum lighting. Fat-tailed geckos are insectivorous, so the stable of their captive diet should be gut-loaded domestic crickets. Other items such as grasshoppers, roaches, pill bugs, mealworms, pinky mice, and wax worms may be offered occasionally. Prey items should be coated in a high quality reptile calcium supplement at every other feeding. Adult animals should be fed 6-10 appropriate sized insects 3 times a week. Baby geckos can be fed 5-8 insects 5 times a week. 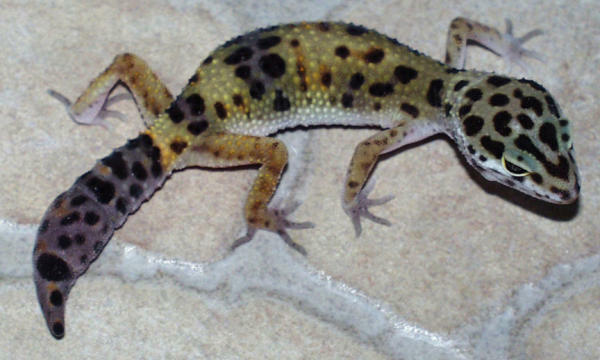 Fat-tailed geckos can be mature as early as 8 months, depending on the feeding regimen, but 12 months is average. Males should not be housed together, they will fight aggressively. Some breeders separate the male from the females before the breeding season, while others leave the groups together year-round. Both approaches will work, but separating the male for a period may stimulate courtship activity and allows the females to regain their energy reserves. A 4 week brumation at 70-75 degrees during the night, and 80 degrees during the day will stimulate breeding. The period from copulation to oviposition can range from 10-35 days. Fat-tails can lay up to five clutches a season, two eggs in each clutch. Occasionally, 10 clutches or more may be laid by an exceptional female. The interval between clutches is 10-25 days apart, depending on temperature. The eggs should be incubated in a water to vermiculite ratio of 1:1 by weight at 85 degrees F (29.4 degrees C). Incubation times range from 60 to 75 days. The neonates should be housed individually if possible, but otherwise have the same requirements as the adults.